Saturday 9th June saw the inaugural County Championships, an event that pitted participating counties against each other for the first time. Bristol was recognised as a County in its own right, meaning that crews were selected from the two clubs within that county – Bristol Gig Club, and Clifton. The competition was run as a series of one-off races between the county crews, across different categories. 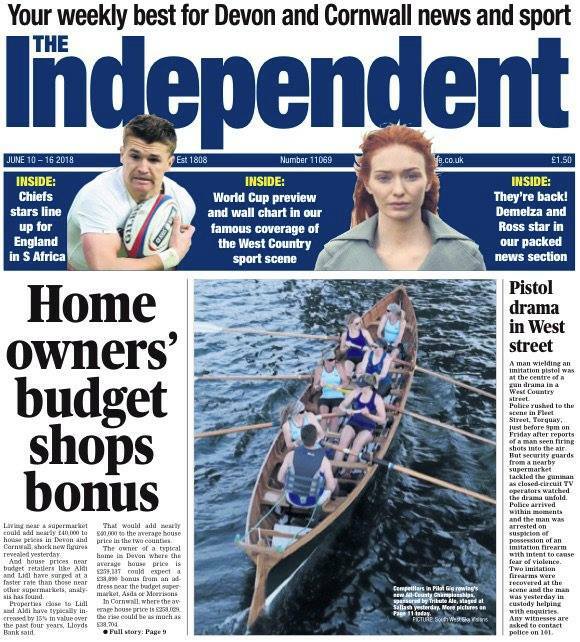 This year the competing counties were Cornwall, Devon, Somerset and Bristol..
Our women’s county crew even made the front page of The Independent. Bristol rowers are Hayla, Becks and Caroline. Lovely hot and sunny conditions in Saltash for the two events – some would say maybe even too hot! The course was in a kite shape, with some tight corners to contend with. All crews had at least 3 or 4 races. Special mention to Lesley who ended up doing around 6 races after offering to sub in for a Clevedon crew.